The piano by which all others are judged. For over 163 years, Steinway has been making the worlds finest pianos. Each instrument is handmade in New York City using the highest quality materials by skilled artisans to ensure uncompromising expression and value. The design of the Steinway piano is unparalleled employing over 125 patents and unique methods of production invented by Steinway & Sons. Browse our product page to learn more about specific sizes and finishes of grand and upright models. The only piano handcrafted in America with all North American materials for over 163 years. Highest investment value and resale value of any piano brand in history. Unrivaled sound with depth and tonal range to inspire any music lover-beginner to professional. The highest quality materials and craftsmanship of any piano. The very first Steinway & Sons patent was granted in 1857, and since that time, the company has been granted more than 125 additional patents. 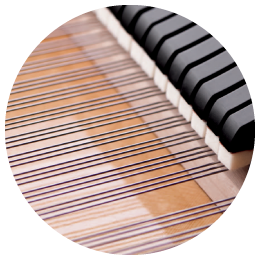 As a consumer shopping for a piano, it is important to consider what design elements have gone into the instrument that you are considering. The unique design elements of a Steinway translate into tone, dynamic range and longevity. The current production of the Steinway & Sons soundboard is based on a 1936 patent to achieve optimum performance in dynamic range, and maximum sustain. Under this patent, the soundboard is gradually tapered from the center to the edge, permitting freedom of movement and creating a sound of unparalleled richness, sonority, and sustain. Does it make more sense to buy a new Steinway or a Used Steinway? 1. When it comes to Steinways, older pianos are better than new pianos. There are a lot of stories that people tell about why older Steinways are better. These myths are simply not true, and the internet age has made it even more difficult for consumers to get reliable information. A well made piano can last for decades. 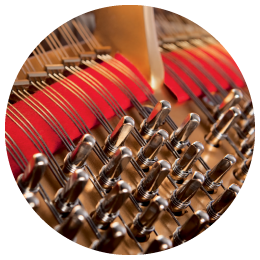 Steinway pianos will generally perform flawlessly for a period of about 40-50 years, but any piano will eventually need major repairs to restore tone, touch and value. At this point, an older Steinway will typically need a $30,000 to $45,000 investment to restore it to the performance that it once had. On the other hand, new Steinway pianos are made to an ever improving standard of sound and performance and will still outperform a perfectly restored older model. 2. You should only look at Steinway’s from the “Golden Era”. This one always sounds a little suspicious because the “Golden Age” always seems to coincide with the era of the piano in question. Steinway pianos have always been meticulously handcrafted and capable of great sensitivity and power. There is no one period of time that produced better Steinway pianos than another, but the quality of the instruments has always been at the top of the piano world and the quality of sound and touch has consistently improved over the years. 3. The internet has made it easier for consumers to buy good used Steinway pianos. Everyone has heard that you cannot trust everything that you read on the internet. Because it has become so easy for people to publish their opinions, there are plenty of critics. The only way to be sure of the information that you are reading, or the piano that you are looking at, is to see it for yourself. Visit your local piano expert and get a sense for what they are showing and telling you. Audition pianos live because no online video can show you the tonal depth or limitations of an instrument. 4. We sell restored Steinways. Many rebuilders will tell you that they sell restored steinway pianos. This is not possible. First of all, Steinway does not sell the essential parts that are needed for restoration-the soundboard and the pinblock. The reason is that these parts must be installed in the factory the way they were originally installed when the piano was new. An older Steinway piano is not restored unless it has gone to the Steinway factory in New York for restoration. At best, some new parts (often non Steinway) have been supplied or a new soundboard has been installed which will vastly alter the sound and value of the piano. At worst, the seller has simply cleaned up and tuned the instrument. 5. We use a certain part in our restoration process that is better than the Steinway part. Steinway makes every part that goes into a Steinway piano. Some of these parts are available to technicians for general repairs, but many rebuilders will tell you that they use a different part that they consider “better.” Usually, they buy these aftermarket parts because they are cheaper. 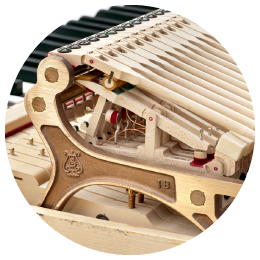 The fact remains, if you want the true sound and performance of a Steinway piano, you must use the parts that were made for it by Steinway. Would you buy a Porsche that had a Ford engine in it? Or Volkswagon breaks? 6. Due to the many changes in ownership, Steinway pianos are no longer made the way they used to be. Steinway has changed ownership over its 163 years. Today it is, once again, a private company. But, the materials used in the pianos and the artisans that make the pianos by hand have not changed. The same artisan and apprentice system has been used on the factory floor during all of those changes. 7. You can buy a Steinway that is just as good for much less by buying a rebuilt or used Steinway. As a piano buyer, you should be careful about the value of the piano that you are purchasing. We have already discussed why the older Steinway pianos do not perform as well as new Steinways. But, saving money with used instruments can be tricky. The cost of restoring a Steinway at the factory is around $45,000 so if you buy a used piano and need to send it for restoration in order to ensure its performance and value, you could end up spending more than a new Steinway. Debra’s dedication during our purchasing process has been one of our best shopping experiences. We had the great opportunity to have been advised by the owner of the store, arriving with his help to the best decision on the new piano for our daughter. While Steinway & Sons is known by its international reputation as a builder of the highest quality pianos, it should also be known for the quality and level of local service that it provides customers like me. As one of those customers, I can personally attest to the high quality of service that I have been receiving since I purchased my piano over a year ago from Steinway Madison located in south central Wisconsin. The attention to my questions and the help that I have received from owner Ben Garber and his right-hand employee, Debra Galla, can only be described as above and beyond the call of duty. Very happy with our purchase and the support since. I would recommend Steinway Piano Gallery to anybody! The owner was willing to sit down and talk with me about what I wanted and wasn’t pushing to make a sale. He helped me think through the process of buying a piano, where other stores did not help me in that way. He was willing to answer all my questions and was very knowledgeable. It was a fun experience and I love my piano! The service at Billings Piano Gallery was great! Everyone was very knowledgeable, which made looking at different pianos really easy and fun. I would recommend them to anybody and I am just thrilled with my new piano! How are Steinway pianos made? Specialists work on different parts of the piano during the manufacturing process. Each factory uses the best, most modern tools and machines available to them. The skills required to cast plates, season wood, fashion hammers, assemble actions and countless other processes are each unique. No one person can be really good at all of them, so it really does take a village to build a piano. A Steinway & Sons piano requires over 1800 hours of labor while the typical piano takes a fraction of that time. Budget pianos are built even faster. Steinway & Sons uses a rigorous apprentice program to insure their exacting methods are passed down from one generation of craftsmen to the next. These videos show the similar methods between a Steinway built in the 1920’s versus the modern Steinway piano built today.